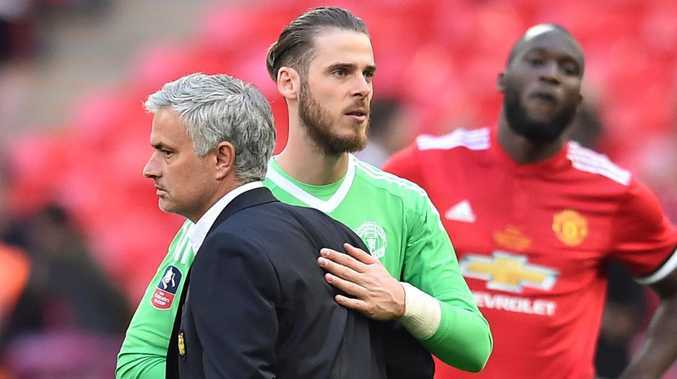 Jose Mourinho reacts with Manchester United goalkeeper David de Gea after losing the English FA Cup final to Chelsea. The Red Devils' overall value increased five percent compared to 2017 to more than $3.77 billion, (£2.8 billion, $A3.77 billion), beating Real Madrid on $2.9billion euros and FC Barcelona on $2.8billion euros. "We calculate the assets of each club, if they own a stadium for example, the value of the players, but also the value of the brand or image with advertising contracts and their reach on social networks," said Jacques Boussuge, head of sports advisory at KPMG. 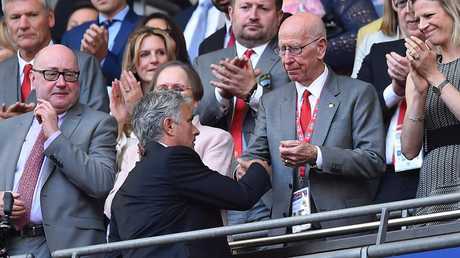 Manchester United manager Jose Mourinho shakes hands with Manchester United and England legend Bobby Charlton after losing the FA Cup final . "PSG is progressing, but it takes time and is limited by financial fair play regulations," Boussuge said. In total, the financial value of the 32 clubs reached an estimated 32.5 billion euros, a nine per cent increase on 2017.